In our most recent flame on the RBA Governor ( “Final Proof That RBA Governor Glenn Stevens Is Either A Liar, Or A Blithering Idiot” ), we saw how Stevens lied about economists failing to predict the GFC. In a speech at a fancy dinner, at the peak of the GFC. While celebrating his $234,000 p.a. pay rise. Now, we learn that Stevens lied about RBA officials’ knowledge of corruption in their own ranks. Some of the Reserve Bank of Australia’s most senior officials were involved in covering up extensive evidence of corruption inside the central bank’s subsidiaries, Note Printing Australia and Securency. An investigation by The Age has found top RBA officials suppressed damaging information in 2007 and 2008 about the payment of secret commissions to middlemen hired by the RBA firms to win banknote contracts in Nepal and Malaysia. The evidence of the cover-ups is contained in internal documents from the RBA and the banknote firms, including many seized by the federal police after executing search warrants. 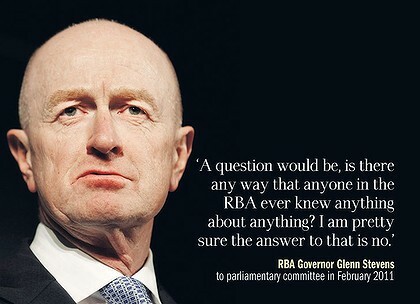 The documents challenge RBA governor Glenn Stevens’s statement to a federal parliamentary committee in February that ”no one in the Reserve Bank or on our board” knew of corruption allegations involving Securency and NPA before The Age revealed them in May 2009. And we the taxpayers are (given no choice in) paying this bloke over $1 million per annum. ← Dam It! At Last!! “End the Fed” starting to sound familiar??? Hell, end the lot of them…The RBA, Bank of England, The Bundesbank, The Central Bank of Canada, The Central Bank of Vietnam, the Banque de France, the Oesterreichische Nationalbank, the ECB, the IMF, the World Bank, the EFSF (the European FUBAR Slush Fund), the Bank for International Settlements,(BIS) .. the lot of them. For all we know, they are probably affiliated with and set up by the same people who set up the FED to start with almost 100 years ago. And probably for the same reasons. i.e .to slowly and subtley drain the wealth of the planet via the debt-based monetary system currently operating in every country and region in the world today. operating as the national bank for the government of Australia. Has anyone thought about exactly when inflation became an issue in this country??? It sort of coincided with the establishment of the RBA around 1959/60. Took a few years to get going, but once inflation was established, we sort of just accepted it as a given. Inflation is not a normal part of a stable economy!! It is a “stealth tax”,which assists politicians to buy votes by promising impossible to afford benefits, as well as impossible to justify mal-investments. Abolish the RBA. Abolish paying “the cash rate”-currently 4.75% on our own money). Stabilise our monetary system by going bank to our own national bank , charged with the responsiblity of supplying our own DEBT-FREE money. You speak my mind, TS. Just stating the bleeding obvious, BI.. These days, it seems Truth really is stranger than Fiction. Alas, back to the GRINDSTONE. 1.Kill Gillard’s (dare I say Wall Street’s??) Carbon Trading Derivatives Platform. 2. Get our lovely country back into the hands of real people (of ALL political persuasions) and expose the frauds and hucksters on both/all sides of politics. 3. Support pollies like Barnaby (and Angry) who truly represent the best interests of ‘We the People” and who have the guts, balls and brains to fight the good fight. 4. And End the FED/RBA!! 5. Craig Thompson for Australian of the Year for services to the citizens of Australia.